ant to fill in some branches of your family tree? If you have New York ancestors, The Old Fulton NY Postcards Website (www.fultonhistory.com) can help! In addition, quite frequently you will find references to people from other states and countries. Try putting in the terms “[surname] reunion” using exact search. Then scroll through the results (or hit Ctrl + F) for a newspaper from a town where you believe your ancestor resided. As you can see, it is filled with names and locations—a great springboard for research. ROBERT and ELEANOR HALL TAYLOR, my 2nd great grandparents, came to this country in the mid-1800s from Lincolnshire, England. I recognize many of the names listed in the article, but there are some I need to investigate. If you haven’t explored historic newspapers, you are missing a critical tool in unpuzzling your past! Dover Publications, Inc., Mineola, New York, Electronic Clip Art,Victorian Decorative Letters, 1999. 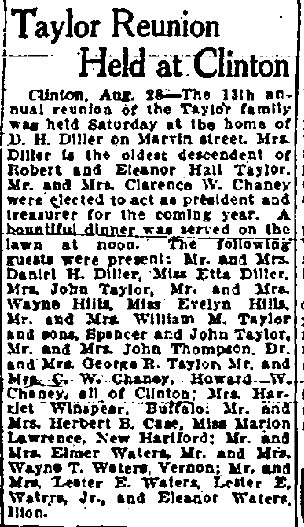 (1) "Taylor Reunion Held at Clinton," The Utica Observer Dispatch, August 23, 1922, Old Fulton NY Post Cards, digital image 372622 (www.fultonhistory.com).